DeskBell Chain – Blockchain platform of the hotel and tourism industry. DeskBell is a service for the hotel business; IT-complex, including mobile and service applications together with server capacities. DeskBell has been developing for more than three years, has been tested in a number of the hotels. At the same time, the base covers more than a million hotels and hostels of the world. DeskBell is a ready-made, working technological solution: a website for hotels and mobile applications for iOS and Android. DeskBell implements geolocation mechanisms, a directory, announcements of events, and also represents an advertising platform. Being a dynamic and environmentally friendly alternative to hotel printed products, the service has a powerful potential for promoting both existing and developing services. Now the service is presented mainly in the regions. DeskBell provides hotels with the opportunity to communicate with guests on a real time basis and updates information on the services, facilities and events of the hotel. DeskBell aims to encompass the tourism industry, the advertising sector, parallel to implementing the CRM system, plus planning and business automation (ERP) in the field of marketing. DeskBell plans to combine the world’s hotels into a single geolocation network, creating on their basis targeted sites connecting tourists at their place of residence. DeskBell also becomes an aggregator of statistical information about world currents in tourism, local features and preferences, thus opening wide opportunities for delivering targeted information to the end user. New challenges, the search for a monetization mechanism and the active development of blocking technologies naturally led us to the need to expand DeskBell’s service by developing and implementing a project based on Ethereum-DeskBell Chain. DeskBell Chain — (DBC) is a project of the blockchain platform as a part of DeskBell, aimed at creating a unique monetization mechanism: an ecosystem of mutual motivation that encompasses all aspects of the process, and expands the service to the tourist business in the region of the hotels. The project will create a DeskBell Token (DBT) token based on Ethereum in accordance with the ERC20 standard, with an output to ICO, and for the turnover in the DeskBell platform. Blockchain project ‘DeskBell Chain’ is based on the existing DeskBell service, which enables hotels to get out an important information to the guests and keep communication with them via chat. What is more, it also sells the site to promote their services. For tourists, DeskBell service serves as a guide and compass in the life of the hotel. DeskBell automatically determines the hotel, in which the tourist is located and provides accessible information, making the stay more comfortable and active. the database covers more than a million hotels and hostels of the world. system of internal chat (tourist — tourist and tourist — reception). XXI century — the era of the penetration of information technology in all spheres of life, where one of the key roles is played by the Internet and mobile services. Practically everywhere, in any industry, IT-services are being introduced in order to deliver information, socialize and increase dynamics, show interactivity of services and automation of business processes. The sphere of mobile service in hotels, as the very appearance of mobile technologies, is a historical and logical inevitability. However, there are still no standards in the industry, and standards may not arise if there are no pioneers and attempts to develop them. In the hotel and tourism business there are many Internet systems in the field of booking, organizing tours and responding to customers. Automation and mobilization in the hotel business are represented by own projects of large hotel chains or commercial point implementation projects. At the same time, for small and medium-sized hotels such developments are currently unavailable and economically unjustified. 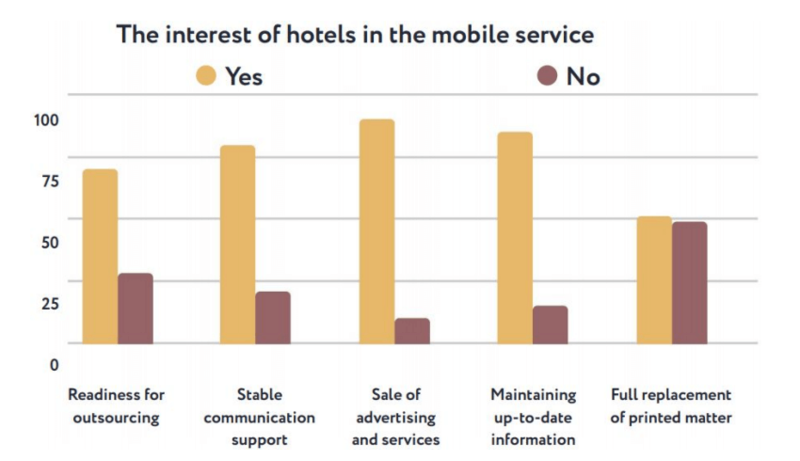 There are more than a million hotels and various locations in the world, of which only about 5% support their own mobile developments and are part of large networked hotels. In the market there is one project aimed at creating an industry standard — DeskBell, as free software package, available to any hotel in the world and has a huge potential for development in the tourism industry. According to the marketing testing conducted by the DeskBell developers themselves, about 70% of the hotels are ready to implement third-party software products and use the mobile Internet service. Summing up the research, the ratio of the industry and its customers, the depth of penetration of mobile and online services, relying on the experience of our own specialists, we are considering the possibility of reaching over five hundred thousand hotels in the world, which are planned to be attracted through 2020. Undoubtedly, the effect of using the DeskBell service will also affect the tourism industry in the regions and, accordingly, will involve millions of active users. Further growth will be conditioned by the world development of tourism. We adequately assess the possible risks of business development, primarily in the emergence of competition and the complexities of marketing promotion, however, we are ready to take measures to overcome them. DeskBell is a pioneer in the standardization of mobile hotel services offers an innovative model for the monetization of DeskBell Chain, we expect an explosive growth in service — in proportion to marketing investments. DeskBell Chain creates a model of interaction between business and clients in the sphere of tourism, replacing the usual mechanisms of marketing programs and the implementation of services by motivated participation of all parties and the socialization of the service. Hotels and their guests, nearby establishments, local business and the whole region will be united in a mutual exchange of services, offers and events, with the turnover of DBT tokens, which act as a motivating reward for the participation and distribution of services. DeskBell Chain is an innovative solution. On the one hand, it develops the popular and already widely used traditional mechanisms of targeted geo-referenced advertising. On the other hand, it introduces solutions that were not previously applied. Thus, a wide range of information and social mechanisms can be used in the DeskBell Chain ecosystem. For example, users will be able to perform certain marketing tasks in a transparent scheme of motivation with genuine transactions, thanks to the blockchain technology, and the objects of tourism will be able to build up the exchange chains in interaction with the target audience. Of course, the demand for advertising services will support the development of DeskBell Service. The introduction of BlockChain technologies in DeskBell is a step in the development of the Company, allowing us to fulfill the main goal more broadly and effectively: making traveling easier and comfortable getting vivid and positive impressions from it. The DeskBell Chain project will provide a flexible innovative system for monetizing service capabilities, creating quality marketing services for customers and users. DeskBell Chain is a flexible platform for the implementation of marketing programs, mechanisms for the exchange of events and active participation in the process of information exchange based on the database of hotels and tourism business using geolocation data and targeted statistics. DeskBell Chain will provide motivation to tourism facilities, accumulating tokens, simply being members of the ecosystem, with the subsequent use of tokens for services. In the process, mutual motivation will be implemented: with economy and compensation of expenses, with an honest exchange of information and social services. Also, tourists, end-users, will be motivated to perform various activities, participate in programs of hotels and tourist business, combining rest with fascinating and useful occupations. Of course, all members of the ecosystem can arbitrarily change roles, building their own chain of exchange of proposals and tasks. 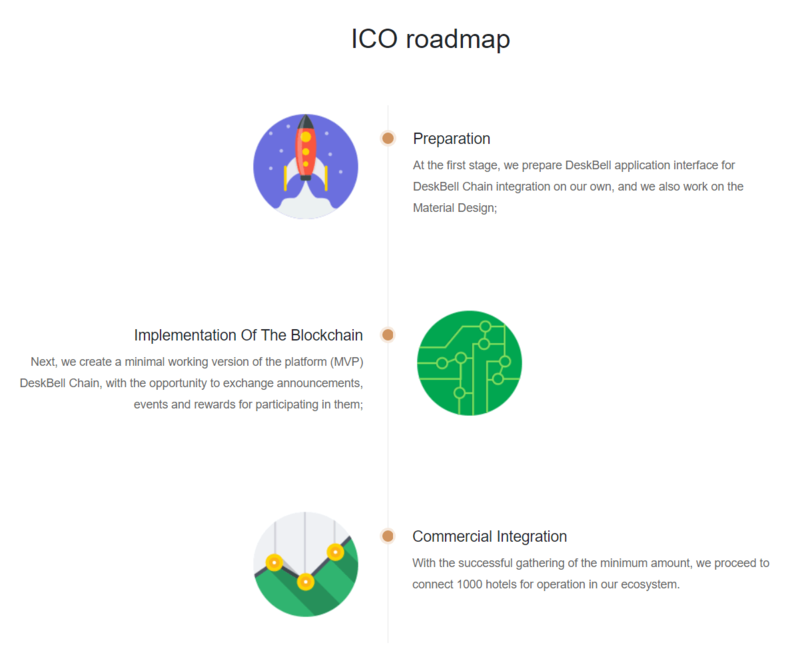 Development and implementation of the ecosystem of mutual motivation DeskBell Chain; Finalization of the current service and mobile applications, implementation of new functionality required for the DeskBell Chain platform. 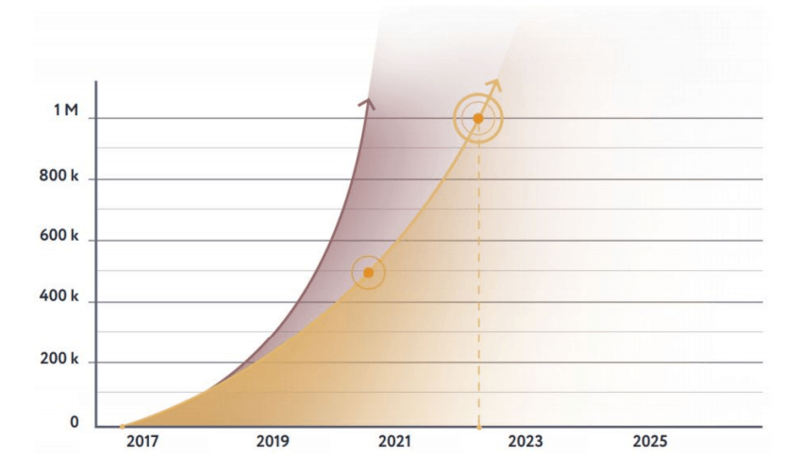 Development of DeskBell systems: chat, socialization, events and alerts, the introduction of elements of augmented reality; Scaling service , due to the expected growth , reaching CDN; Entering the service of tourist business; Development of a payment system for goods and services through the mobile DeskBell application. Expansion of the service part to the functionality of CRM and ERP systems; Going beyond mobile applications: the development of third-party cross-services in the tourism industry, a unified database of hotel and tourism business, global search and booking in the framework of the monetization of DeskBell Chain.